Nurses play a very important role in the healthcare system. They help provide care to patients throughout their treatment period. Being a highly regarded profession, nurses are required to uphold high ethical standards on all aspects including dressing appropriately. Failure to do this will mean that you do not value or respect yourself and the patients under your care. So, below are tips to help you dress decently and professionally as a nurse. As a nurse, you will be handling lots of things at a go including carrying medications and preparing patients for surgery among other duties. This will expose you to various possible stains, thus it is important to find yourself the best Mobb nursing scrubs. You will not want to be handling patients or medications while wearing your best outfits. Additionally, having a nursing scrub on will make it easy for patients and people around the hospital to identify you easily. It simply makes you look professional and someone who conforms to the nursing ethics and principles. The good thing is that scrubs come in different designs and colors. Choose one that has the best color and which fits you perfectly. But ensure that it goes with the organization's colors. 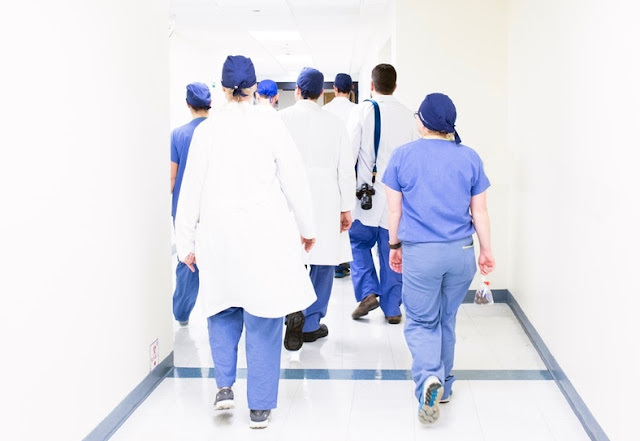 If your hospital wears light blue scrubs, then don the light blue ones. The perfect scrubs should allow ease of movement and should have pockets for carrying phones, a pen, and a notebook. Nurses are usually very busy people and they will in most cases be up and down the hospital moving from one point to another. You need to be able to walk easily, quickly, yet remain stable. This makes it very important to have very light and comfortable shoes. Keep off heels as they will restrict your swift movement. The perfect shoes would be white in color and can either be closed flats or simple rubber shoes. Such shoes are very comfortable to wear and move around with fewer struggles. In addition, they are also perfect to ensure that you do not have to be worried about stepping on patients’ vomit, spilled medications or even blood. Nursing profession requires utmost professionalism all through. It is not a fashion competition where you are competing with others for the title of who has worn the best makeup. Generally, makeup is not bad at all. In fact, it is encouraged to ensure people look smart, but it should be done with moderation. Keep it simple and light and do not go overboard. Too much makeup will lead to unnecessary distraction for your patients, fellow nurses and other hospital visitors. If you are not comfortable with makeups then you can go natural which is highly encouraged. Whether you are wearing scrubs or uniforms, it is imperative that you pay attention to your accessories and hairstyle. If you are a male nurse, then keep your hair short and clean. If you are a female nurse then ensure you keep your hair in ponytail style or simply short to avoid it hindering you from discharging your duties properly. In addition, ensure that you tone down on your accessories and most importantly your jewelry. Keep it simple at all times when you are on duty. You can simply wear a watch, a ring, and simple earrings. This will avoid any kind of distractions. What Does Detoxing from Addiction Mean? How Short Film Impact & Inspire Our Society?